ADDIS ABABA, May 16 2016 (IPS) - Beekeeping and silkworm farming have long been critical cogs of Ethiopian life, providing food, jobs and much needed income. According to some scholarly research, beekeeping is an ancient tradition dating back to Ethiopia’s early history – between 3500 and 3000 B.C. Collecting and selling honey and other bee products produced in homes and home gardens is common throughout the country. Meanwhile, silk production or sericulture is a growing industry in Ethiopia and it offers a solution for the government’s quest for ways to expand the textile industry. But both practices have never been fully exploited to directly benefit young people. Alemayehu Konde Koira, Youth Livelihoods Program, senior manager with The MasterCard Foundation, views it as a huge opportunity. “With relevant and adequate support, honey and silk production and engagement across their respective value chain could be key sectors of opportunity for young people,” he said. The result has been combining expertise on insects with funding to empower youth in Ethiopia. The International Centre of Insect Physiology and Ecology known as icipe with over 20 years of experience in implementing beekeeping and silk farming enterprises in Ethiopia’s Tigray, Oromia and Southern Nations, Nationalities and Peoples regions has been matched with the MasterCard Foundation’s commitment of more than 31 million dollars in financial inclusion towards youth employment and education initiatives in Ethiopia since 2010. Earlier this year, the two organisations announced a 10.35-million-dollar (about 220 million Ethiopian birr) five-year Young Entrepreneurs in Honey and Silk farming initiative aimed at creating employment opportunities for young people through beekeeping and silkworm farming. The project leaders said they will mainly focus on peri-urban and rural youth who face a variety of constraints to ensuring sustainable livelihoods and decent incomes. Women will also be employed by the project. “The opportunity exists for harnessing the not often exploited potential of honey and silk-based value-added products through income-generating enterprises owned and run by Ethiopian youth,” icipe Director General Segenet Kelemu told IPS. She said this will enable youths to establish and grow their own businesses. Kelemu said honey and silk production business activities have the potential to provide a wide range of economic contributions, mainly income generation from marketing honey and its by-products (beeswax, royal jelly, pollen, propolis, bee colonies, and bee venom) and the creation of non-gender-biased employment opportunities. “Ethiopian honey production is characterised by the widespread use of traditional technology resulting in relatively low honey supply and poor quality of honey harvested when compared to the potential honey yields and quality gains associated with modern beehives,” she said. According to Kelemu, modern beehives yield around 20kg of high quality honey as compared to 6-8 kg of yields from traditional beehives. 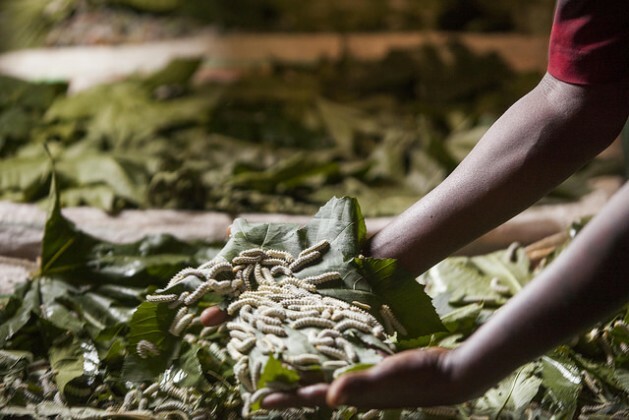 “Silkworm rearing, on the other hand, is a new agrobusiness technology in Ethiopia and on various occasions has been targeted as a tool for employment creation and poverty reduction,” she said. The Ministry of Women, Youth and Children Affairs and other government departments will select the youth between 18 and 24 years of age who have completed a grade 10 education from the East and West Gojjam of Ethiopia’s Amhara region and Gamo Gofa in the Southern Nations. “It’s a project that applies research and technology for the benefit of young people and communities,” Koira told IPS. He said young entrepreneurs will receive starter kits and equipment that include modern beehives, honey processors, silkworm rearing trays and silk yarn spinning wheels to get their businesses started. Koira said the project design combines technical skills in production, processing and marketing across the honey and silk value chains, as well as life skills, including entrepreneurship, leadership, interpersonal and communication, business development, and access to financial education and services. Importantly, the project will create links to local, regional and international markets, he said, adding young entrepreneurs will make the best uses of innovative technologies and acquire tools and resources to develop their own enterprises. Koira anticipates the project will create employment and entrepreneurial opportunities for 12,500 young people in beekeeping and silk farming in Ethiopia for youths out of school and earning an income of less than two dollars day. He said it’s expected that an additional 25,000 people involved in the value chain will benefit from the project. Beekeeping has the potential to generate positive externalities such as ecosystem services through pollination by bees for several food crops within the project region, which will increase the yields of agricultural production thus enhancing food security for the local farming community, added Kelemu. “This project has the potential to benefit 80,000 households indirectly from pollination services,” she said. On the other hand, Kelemu said, the bee and silk enterprises established by the youth are expected to generate income and hence support the household food security. “This will be instrumental, especially in overcoming food insecurity when economic factors are a fundamental cause of food insecurity,” she said.